Valve’s co-founder and managing director Gabe Newell began the talk of a major, impending Valve announcement when he delivered the keynote speech at LinuxCon. He specifically mentioned hardware, leading many to believe that a Steam Box announcement was on the way. “Next week we’re going to be rolling out more information about how we get there and what are the hardware opportunities we see for bringing Linux into the living room,” Newell said. Even if that does turn out to be true and news of a Steam Box is imminent, the other two announcements are unknown. There is a certain level of irony at work here in Valve teasing three announcements. 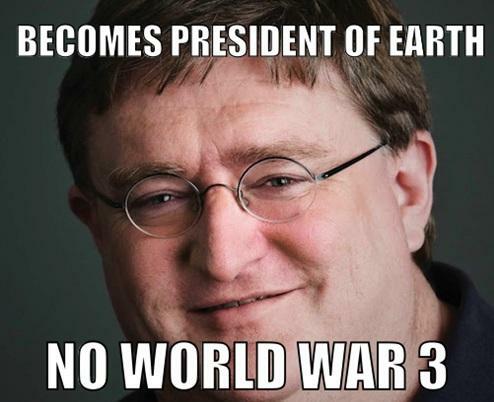 For years now, fans have been waiting for news of Half-Life 3, leading to the meme/joke that Valve, and specifically Gabe Newell, doesn’t know how to count to three. Maybe Valve has a sense of humor after all.